This creamy dill cucumber salad is an incredibly fresh, flavorful easy salad. It takes about 10 minutes to prepare and tastes amazing! Give it a try. 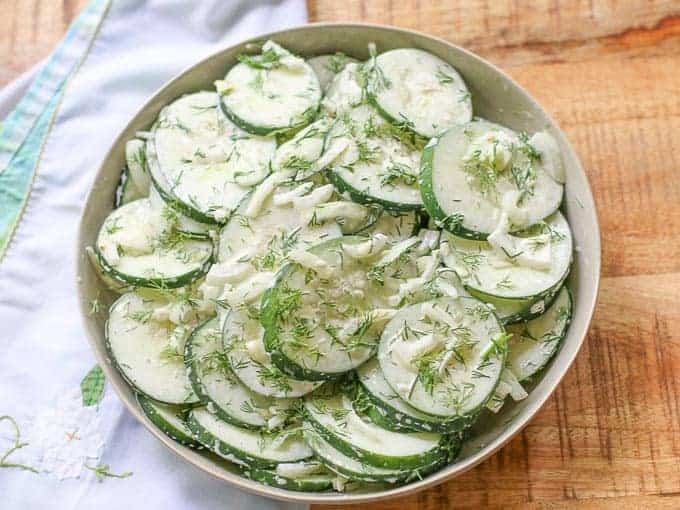 My Grandma Kriz would make this creamy Dill Cucumber Salad with her summer meals when I came to visit. My uncle grew cucumbers and dill in his backyard garden and would bring them over freshly picked for my grandmother. The cucumbers had that summery garden smell and his dill was so flavorful and tasty. 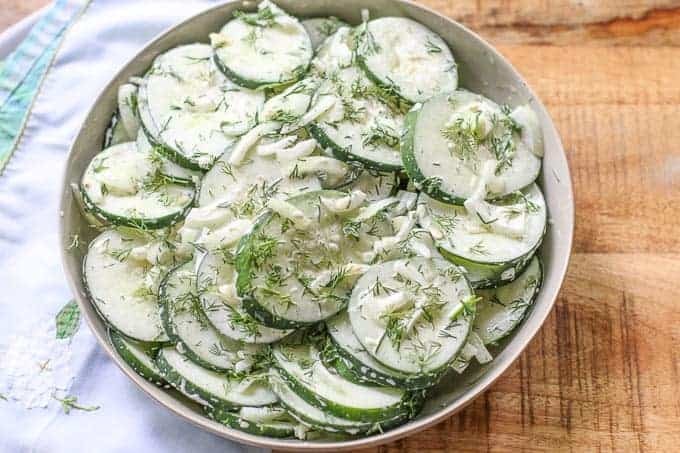 My grandmother would thinly slice the fresh cucumbers, chop up the dill, add her other ingredients, and in just a few minutes, she made this amazing dill cucumber salad. I couldn’t wait for dinner time to eat it. 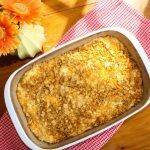 It became a favorite side dish to me growing up and now has become a cherished side dish to my children and husband. It literally takes just a few minutes to toss together and is super easy. to easily cut my cucumbers. You can serve it immediately, but I like it to allow the flavors to build by leaving it in the fridge for an hour or more before serving. If you are trying to go low carb, you can omit the sugar or use a sugar substitute. It is a perfect side dish for potlucks, barbecues, and family gatherings. I hope you enjoy it as much as we do. You can use dry garlic and dill, but fresh tastes so much better. This cucumber salad can get a bit watery if you leave it overnight. It is best served the day of making it. 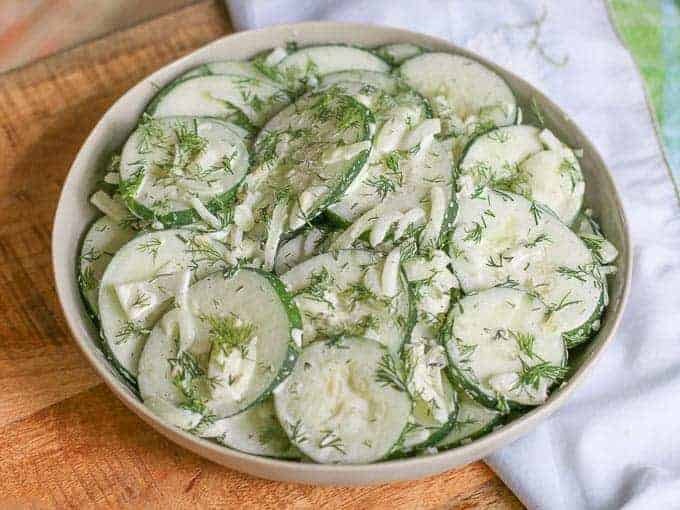 If you enjoyed this creamy cucumber dill salad recipe, check out: Grandma Kriz’s Hash Brown Casserole, She takes shredded hash browns and mixes it with cheese, onions, and few other ingredients. Then she tops it with a delicious buttery, crunchy topping. IT IS GOOD! My Grandmother’s Olive Pimento Cheese Recipe is also delicious and worth checking out. Thinly slice cucumbers. I use a mandolin slicer for perfect cutting. Finely chop onion and mix with cucumbers in a large bowl. In a separate bowl; mix garlic, mayonnaise, sugar, white wine vinegar, salt, and pepper. Add dressing to cucumbers. Mix well. You can serve immediately, but for best results, chill in refrigerator an hour before serving. Strain your cucumbers in a collander over salt for 2-3 hours, then combine all the ingredients, that’s how to prevent it from being too soggy. I am so glad you liked it Julie. Thanks for commenting! Simple and delicious- thanks for the recipe! Easy, simple and so appreciate the low carb and sugar options. Thank you so much for pointing that out. I changed my recipe plugin and it left out ingredients in some of my recipes. I didn’t catch this one. It is updated. I hope you like it. Your recipe says to mix the cucumbers and onion. However, your ingredient list does not include onion, does not indicate the type of onion, nor does it indicate the amount. I love a cucumber salad during the summer time! Dill and cucumbers are a perfect pairing! I just love the cucumber and dill combination! Love how simple this recipe is! I was eating cucumber salads a lot during out Aussie summer… sadly, it’s all rainclouds and jackets at the moment. But I’m loving your fresh dill and cucumber salad and can’t wait to get back to eating them. What a gorgeous salad! It sounds delicious! My mother in law will eat straight cucumbers, raw onion, and rice wine vinegar. I’ve never tried it! This is a recipe I can get down with though. Looks delish! I love the simplicity of this recipe. In the Summer I´m always looking for something quick to throw together! ps. Thank you for your recent comment on my blog! I love the lemon juice and red onion idea! I am intrigued over the horseradish… I have no idea how to prevent it from being soggy. We usually don’t have too much left over. Thanks for the great tips! Yummy! Hi Katie! I just started to make this salad recently. I use some sour cream with a touch of mayo, lemon juice instead of vinegar and green or red onions for color. Lots of fresh dill! Hadn’t thought about a little sugar but I’m sure it balances the flavors. I’ll give it a try. Sometimes I’ll even throw in a little horseradish for a kick. Any ideas on how to get it to last more than one day? Mine gets soggy the next day, if there’s any left! !